I rarely venture near a MAC store or counter and much less so near anything glittery, but the MAC counter at my local Nordstroms seemed to be having a relatively quiet day today - no crowds and just a few friendly SAs - so I decided to check out some of the newer collections, including the aptly named glitterfest - MAC Le Disko Collection. It's mostly eyeshadows in this collection along with 5 lipglosses and 2 eyeliners, and I was quite pleasantly surprised by the texture of the Dazzleshadows. Scroll on for more photos and swatches. 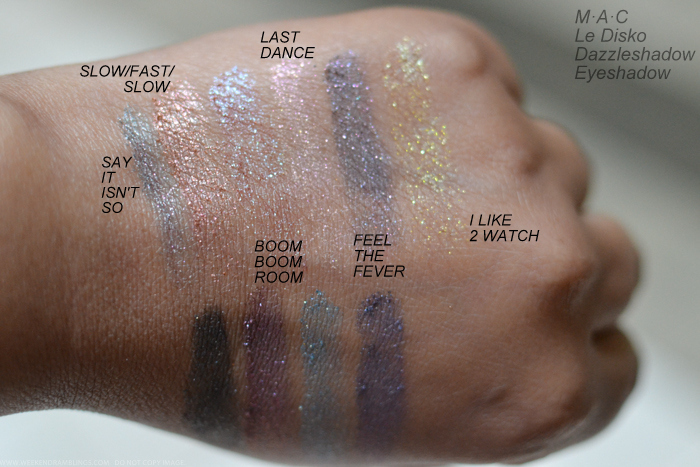 So, yes, the eyeshadows - Dazzleshadows - are quite glittery, and some of them really don't show up well on my swatches, but I think these aren't really meant to be swatched on anyway. Shimmer/glitter like this would show up better patted on, but some of these Dazzleshadows are pigmented enough to even show up with swatches. 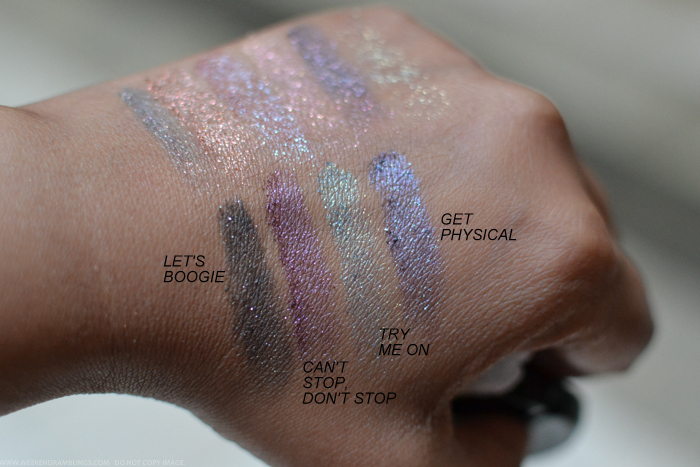 I loved the warm brown and bronze shades, and of course, I am biased toward the deep purples, but if you use shimmery shadows, do give these a try at the counter. I amn't a huge fan of glitter, and even I loved these eyeshadows! 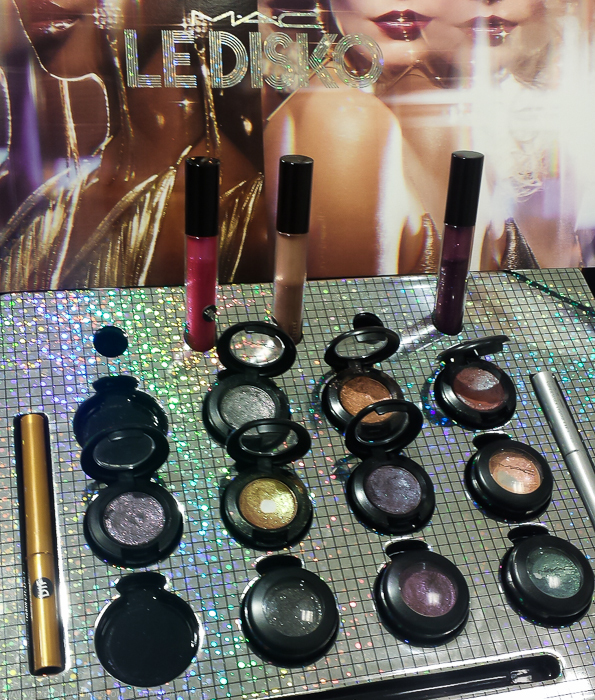 MAC Le Disko Collection also includes some shimmery Dazzleglass and 2 eyeliners - gold and silver. I forgot to swatch the eyeliners and missed out on one of the lipglosses, but here's a look at the few swatches that I did get. 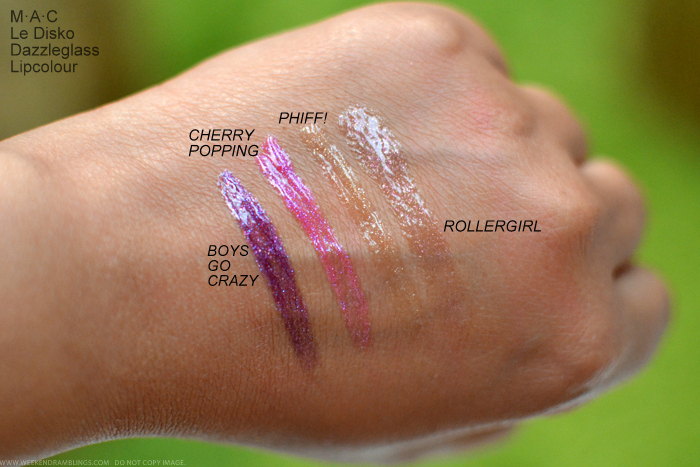 Overall, MAC Le Disko Collection has a lot to pick from if you love some glitter in your makeup. My favorites would be the eyeshadows. Urban Decay does have similar shades - I forgot about that! :D Boom Boom is beautiful..